Keep your lighting low key with just a simple outline of patio string lights. For the decorator on the go, convenient patio light kits combine strings and bulbs so you can illuminate your pergola with ease! If you are looking to create a customize color scheme, our DIY patio bulbs and light strings page has everything you need to get started. Already have your lights? 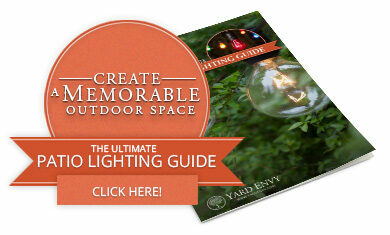 Learn how to hang patio lights with the help of our DIY patio lights guide! To create a scalloped design, take two long strands of patio lights or four shorter ones and hang them from the center of your pergola sweeping down to each column. This creates a canopy of light that is quick to design and oh, so elegant! Combine Textures to Create One-of-a-Kind Pergola Lighting! Mix string lights with fabric swags, create a sparkling canopy with twinkling icicle lights, or hang moravian stars and starlight spheres alongside globe lights to inspire your very own Starry Night pergola lighting masterpiece! If you're not sure what patio lights color is best for your project, we are here to help! Let's talk about the different types of patio lights colors and styles available and how the right patio lights can enhance your backyard lighting designs! Floor to Ceiling Pergola Lights! If you have some extra time to design your pergola lights, you can go all-out while still creating an elegant backyard focal point. Hang patio lights from the ceiling, wrap columns and create a shimmering backdrop with floor to ceiling light strings! Love this look? Here's how we made it happen! Attach strands of clear mini lights on brown wire across the back of your pergola and let cascade down. If you already have beautiful lighting installed or a fan for creating breezy summer days, you can still enjoy pergola lighting with patio lights! Try using your pergola as an anchor for light strings and framing an outdoor seating area as seen below. Run lights from your pergola to backyard trees or illuminate a walkway by running light strings from the columns to the start of your path! Don't have a pergola but love what you see? Take a look at our collection of vinyl pergolas and if you're a pinner too, start planning your patio paradise on pinterest! Pin the pergola pics you love and be sure to #Yardenvy! We can't wait to see what you create! If you've tried a pergola lighting idea of your own, let us know in the comments below!